Nothing defines California and our nation's heritage as significantly or emotionally as do the 21 missions and related historical sites that were founded along the coast from San Diego to Sonoma. Their beauty, stature and character underlie the formation of California. Over time, many mission enclaves have developed into some of California's most significant cities: San Diego, Santa Barbara, San Luis Obispo, San Jose, San Francisco and Sonoma. All 21 missions are California Historical Landmarks. Many have also been designated National Historic Landmarks. The missions stand as a window to our past, an exciting epoch to elementary school children who study the era in the fourth grade, and an insight into our history for all who visit California. The missions are among the most popular tourist destinations in the state, attracting millions of visitors each year. Founded in 1998, the California Missions Foundation was established with the objective of preserving and protecting the missions. 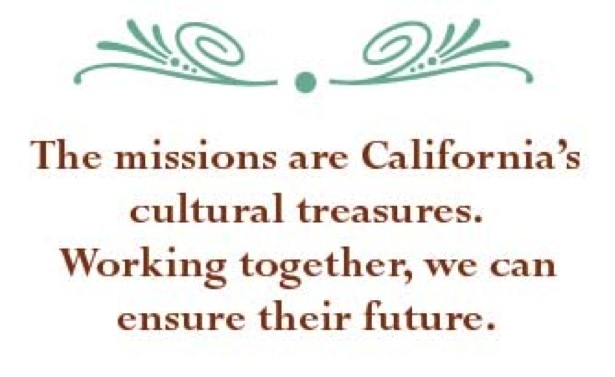 The Foundation is the only organization dedicated to the long-term preservation and restoration needs of all California missions and their associated historic and cultural resources for public benefit. Along with funds raised from the generous contributions from our corporate, foundation and individual supporters, CMF actively works to raise money to fund mission projects from stabilization of structures to conservation of paintings and artifacts and conducting archaeological research. On January 1, 2016, the California Missions Foundation successfully merged with the California Mission Studies Association, an organization founded in 1984 and dedicated to scholarship, research and membership. Together the combined CMF is the only statewide organization dedicated to the preservation and studies of the California Missions and their related historical sites. The future is bright. Our hope is that you will come to share our understanding of the importance of saving these treasures and preserving the heritage of California and of our nation. Without the missions, an important piece of our history would be lost. We invite you to join us in efforts to conserve the missions for all of us to enjoy for generations to come. The missions are California's cultural treasures. Working together, we can ensure their future.